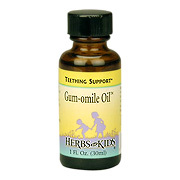 Gum omile Oil is an almond based blend useful for teething and toothaches. Customers have shared many stories of a nights sleep saved by the pain-relieving and soothing effects of this herbal combination. Gum omile Oil contains Clove oil which many dentists still use in their practices as an effective analgesic. Place Gum omile Oil directly on gums to relieve the pain and inflammation of teething. Try it on your own gums and see how well it works! If you feel it is too strong for your child, dilute it with vegetable oil. Avoid directly swallowing herbal oils. Note: Sometimes parents find our Chamomile Calm blend helpful to calm a teething child. Apply sparingly to gums using applicator or finger tip. Reapply as needed every 1-2 hours. Almond oil, Willow bark extract, Chamomile flowers extract, Essential oil of Clove bud and Vitamin E oil. Gum Omile Oil Alcohol Free is shipped in a discrete, unmarked package. Orders are processed immediately and usually take about 3 to 5 working days to be received. We do ask that you try it for 2 to 3 weeks to feel the full effects. Any information received is used only for order processing and shipping purposes. Your information, such as e-mail address, will never be disclosed to a third party.